Ursulaea tuitensis covering a boulder. When traveling through the pine-oak forests of Jalisco, Mexico you might stumble upon boulders covered with some interesting and unique plants. It isn't on just any boulder that you will find these plants, but only on very specific boulders in just the right spot. 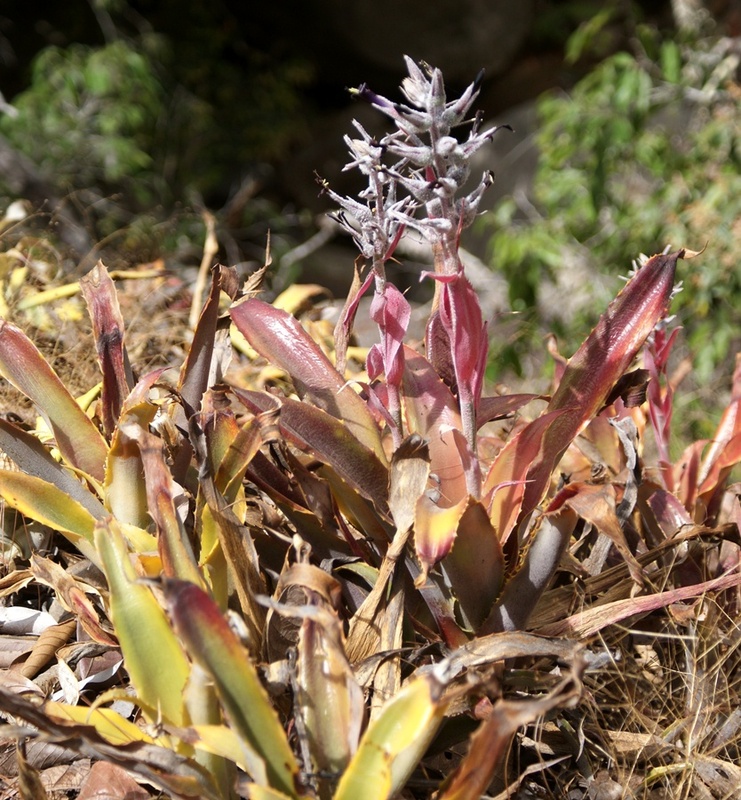 Some plants grow widespread throughout their range filling many different niches, but others are very particular in both how and where they grow. If their distribution is only in a small area they are called narrowly endemic. I have to admit that I am really drawn to plants that are more specific in their requirements. They may be more vulnerable to habitat destruction and climactic changes, but that specificity usually makes for some interesting and unique characteristics. 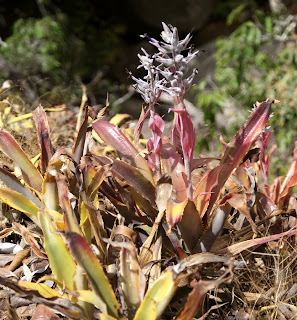 One such species is the bromeliad Ursulaea tuitensis. It is a somewhat elusive plant that only grows in one small region of Mexico--in the mountains around the town of El Tuito, Jalsico. Tucked in the mountains above the beaches of Puerto Vallarta, El Tuito is still a small town that retains much of its original character. The less humid air is carried by a pleasant breeze and is perfect for many interesting plants (as well as tasting raicilla!). U. tuitensis blooming in the wild. 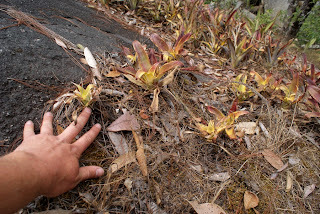 Sharing this rich ecosystem with 20 or so other species of bromeliads and probably an equal number of orchid species, U. tuitensis still stands out as a special plant. 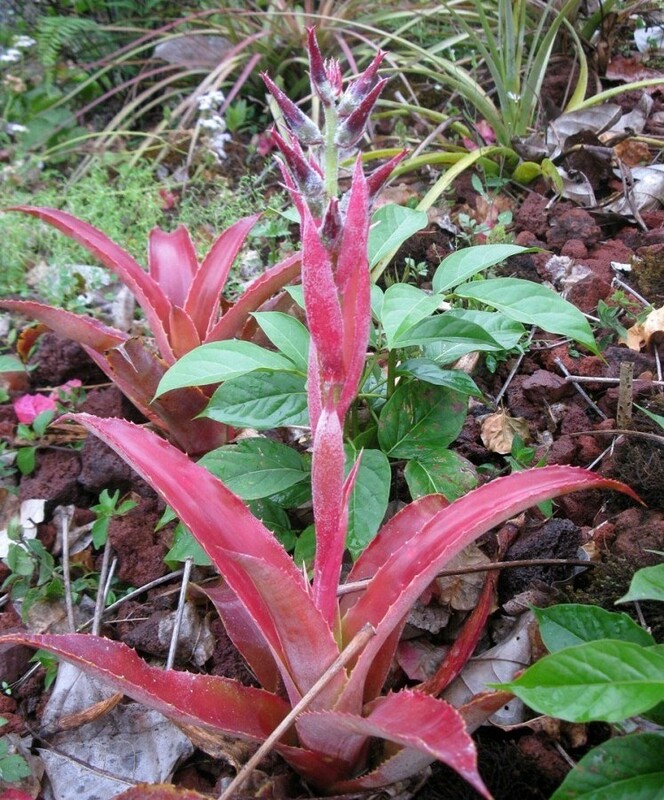 Closely related to the genus Aechmea, it currently is one of two plants in the genus Ursulaea. Both are found on the west coast of Mexico in the state of Jalisco with the other species, Ursulaea macvaughii, also being found just across the border with the state of Colima to the south. 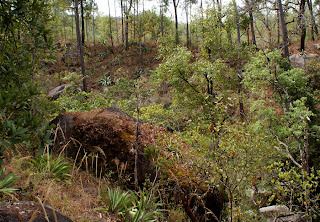 Above to the left you can see a colorful plant blooming in the Vallarta Botanical Gardens, located just on the edge of the natural range. The plants are variable and you can see the plants blooming in the wild (above to the right) are shorter and have more flowers than the plant at the Botanical Gardens. Up close, the flowers are quite beautiful. The intense dark purple petals curl back revealing the pistil and stamens. 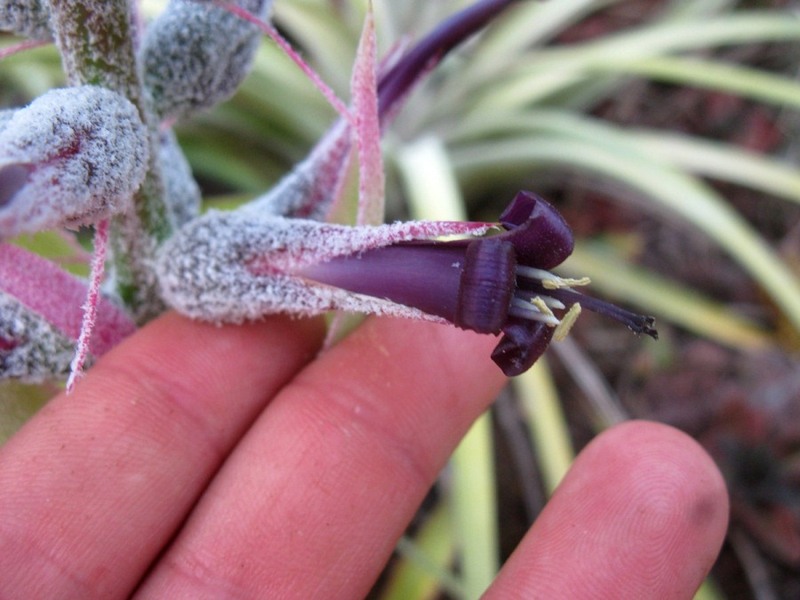 The sepals are covered in a white fuzz just like the other species U. macvaughii and the closely related Mexican Aechmeas in the Podaechmea subgenus. One interesting characteristic of the plant is that it has juicy, semi-succulent leaves. And when you see how and where they grow it all makes sense. They grow on boulders in the open pine-oak forest, quite often in ravines. Being in the ravines in important but not required. The reason then tend to be in ravines is that they only can become established and grow on the boulders that are covered in moss. 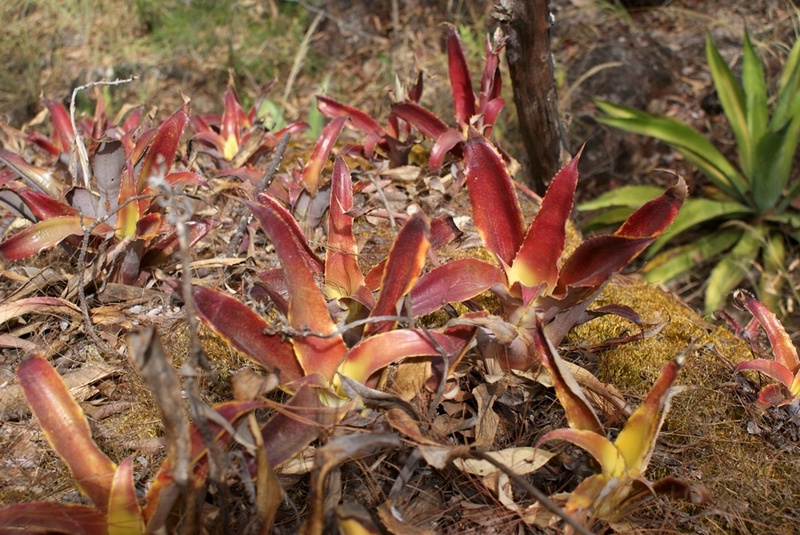 Growing in the moss doesn't provide much nutrients and much access to water, especially during the prolonged dry season. There are many large boulders strewn throughout this region, but only a few are in the right spot to support the moss. Once the moss gets established many other plants then can further colonize the rocks. 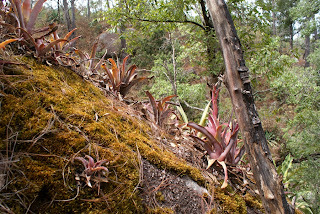 Sobralia orchids, agaves, cacti, Pitcairnias, peperomias, Aechmeas, anthuriums, and other orchids are just some of the plants that can share the mossy boulders with the Ursulaeas. 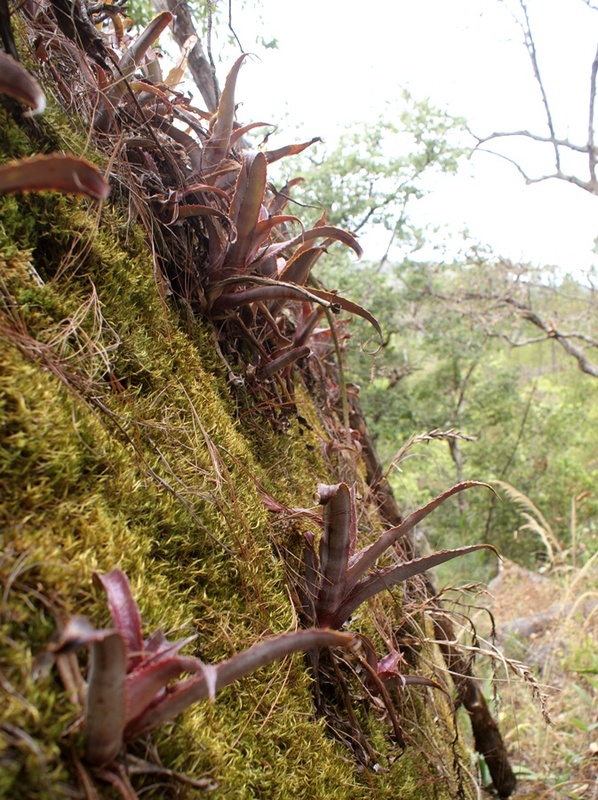 Whether on the flat top or the vertical sides of the boulders, if there is moss, the U. tuitensis can grow! 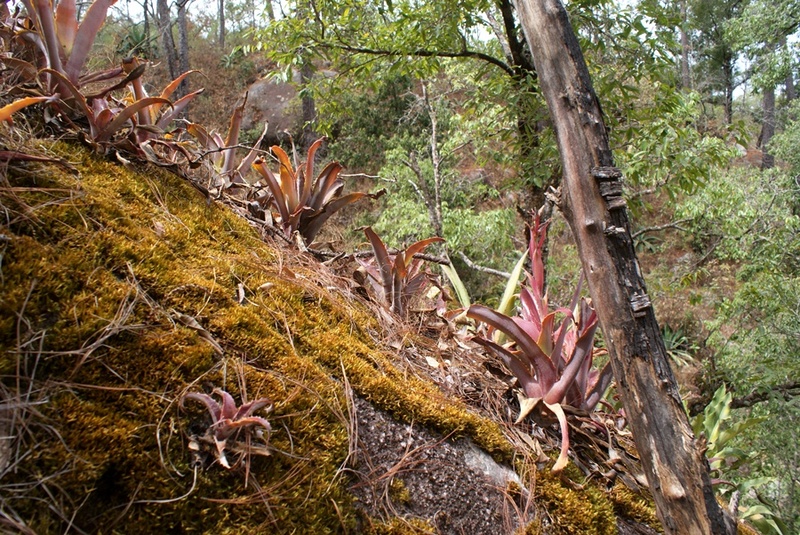 The plants make quite an interesting display as they crawl over every surface of the mossy rock. Spreading over the moss isn't always by seed. The plants crawl along via short rhizomatous stems that are different from all other bromeliads. Because of their tough life on the boulders, oftentimes they will be quite small in the wild (right). While in gardens when grown in good soil and getting as much water as the can use, they can grow to a much larger size. 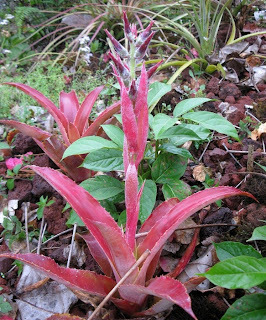 Like most bromeliads they are quite plastic and responsive to cultural conditions (food, water, sunlight, etc). Grown in the shade or with plenty of food and water they will be green. But as seen in the photo below, they can also be a bright and vivid red!